November 6, 2009 (Vancouver, B.C.) —Trees Organic Coffee and Roasting House is pleased to bring back live music nights every Thursday and Friday night from 8:00-10:00 pm at its Granville Street cafe. 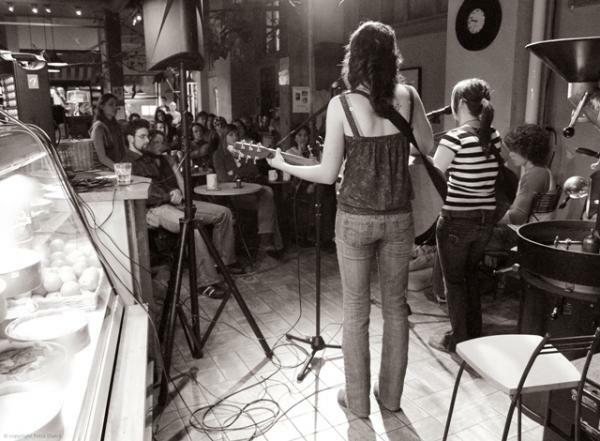 Since 1996, Trees Organic Coffee & Roasting House has been offering local musicians a popular venue to showcase their talents. Earlier this year Doron Levy, the owner of Trees Organic, was forced to suspend the free performances due to sidewalk closures during construction of the Canada Line on Granville Street. Now that construction is almost complete, the popular live music nights have returned. Trees newest location in Yaletown, at 1391 Richards, will also begin hosting live music nights with the first event on Tuesday, November 17th at 7:00 pm. In November the following musicians will be performing at Trees Organic: Jodi King, Mike Weterings, Rick Parnell, Daniel Moir, Stephanie Bosch, Cassandra Bangel, Melissa Endean, Amber Darland and many more. For Trees full live music schedule visit: https://treescoffee.com/event. Trees Organic Coffee & Roasting House is a warm European style cafe with three locations at 450 Granville Street and 1391 Richards Street in Vancouver and 7700 Minoru Gate in Richmond. Since 1996, Trees Organic coffee company has been selecting only 100% certified organic, bird friendly, shade-grown coffee beans that uphold the highest environmental and quality standards possible. The coffee beans are roasted on site in small batches to ensure the best quality and a consistent standard of excellence. Their delicious coffee makes a perfect pairing to tempt the taste buds with sinfully delicious cheesecakes.